Shimmerskin latex bodies, with deep paddle tails, create superb body action and vibration in water. These bloodhead patterns have blood red internal weights covered with Super Holo foil, and are fitted with Mustad 32786BLN hooks. Designed to flash red/blue/red etc when worked they act and look exactly like wounded baitfish. 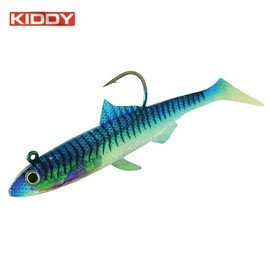 FREE Delivery on all Kiddy Sea Fishing Shads and Soft Baits over £100!! !